A Christmas Day winter storm that brought varying levels of rainfall countywide and snow to the highest elevations in the mountains, was expected to depart late Tuesday afternoon leaving fair weather Wednesday. “We had a lot of rain around the county in the form of showers and brief, heavy rains,” said Brandt Maxwell, National Weather Service forecaster. Maxwell said rainfall was spotty, with some areas receiving little or none. “Julian had the most rain with .88 of an inch, while other places had only a few hundredths of an inch,” Maxwell said. 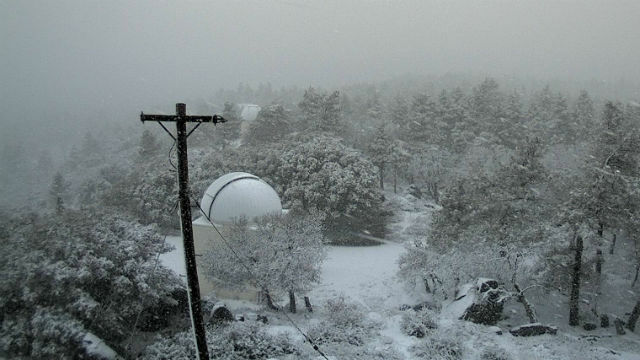 Weather cams showed light snow falling in the mountains in Julian Tuesday at about 11 a.m. The NWS forecaster said temperatures in the wake of the storm would likely be in the lower to mid-60s along the coast and inland valleys. He added nighttime temperatures could be chilly. “We may have lows in the 30s and 40s in the valleys, and in the 20s in the mountains,” said Maxwell, who noted surf was also elevated Tuesday in the five-to eight-foot range.